St Mary’s is here for all the significant occasions in your life and the life of your family – so we have services in which we give thanks for the birth of a new child and services in which we mark the beginning of a person’s new journey of faith. 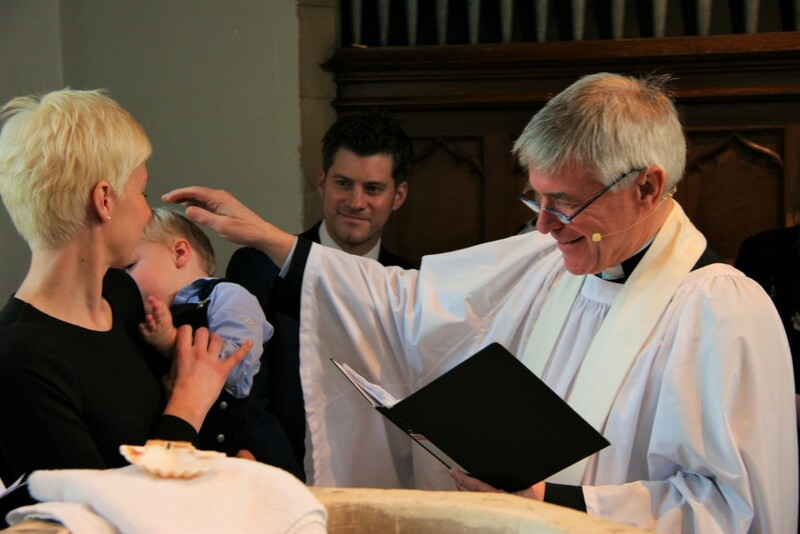 Most of our baptism services (also known as Christenings) mark the arrival of a new child in a family, but we also baptise older children and adults – you can be baptised at any age. The birth of a child is an exciting time. Children are a tremendous gift from God and parents often want to find a way of giving thanks and expressing their hopes for the future faith of their child. For children, there are two possible services : a Baptism or a Thanksgiving. Baptisms and Thanksgivings normally take place as part of our main 10.30am Sunday morning service so that we can welcome the child into the family of the church, but occasionally can be held at other times on a Sunday if family circumstances require. Steve, our Vicar, or any of the Clergy team will be very happy to talk to you about these services and which might suit your family best. In a baptism service, the child is baptised on the understanding that they will be brought up within the Christian faith and that their faith will be nurtured in the home and within a local church congregation. In the service, parents and godparents make declarations and promises about their own faith and about their intention to nurture their child’s faith. It marks the child as part of the family of God and the beginning of a journey towards a faith which the family and church pray the child will one day declare as his or her own. It’s an exciting new beginning for you and your child and we at St Mary’s are here to encourage and support you. when they want to leave baptism until the child can choose it for himself/herself, but would still like to give thanks for their child. when they don’t feel comfortable making the promises and declarations in the baptism service, but recognise that something has happened for which they wish to give thanks to God. These are special occasions in which adults or older children celebrate publicly the beginning of a new life of faith, making the promises in the service for themselves. Every year, one of our bishops conducts a Confirmation Service at St Mary’s or one of the other churches in the area. This is a service of great celebration in which those who have been baptised, usually as infants, acknowledge for themselves and publically declare their Christian faith. At St Mary’s we run short, informal, age-related preparation courses for those wishing to be confirmed. If you, or a member of your family, would like to be confirmed please contact us for more details.